The Cuban Blackbird, known simply as “el Toti” by locals, is among the island’s most recognizable residents. These small but abundant songbirds can be seen throughout Cuba’s varied habitats; low lying woods, open pastures, farms along with city gardens and parks (Jaramillo, Burke) (Orians) (Garrido, Kirkconnell) (Raffaele). Cubans, young and old as well as rural and urban alike, are very familiar with this bird. 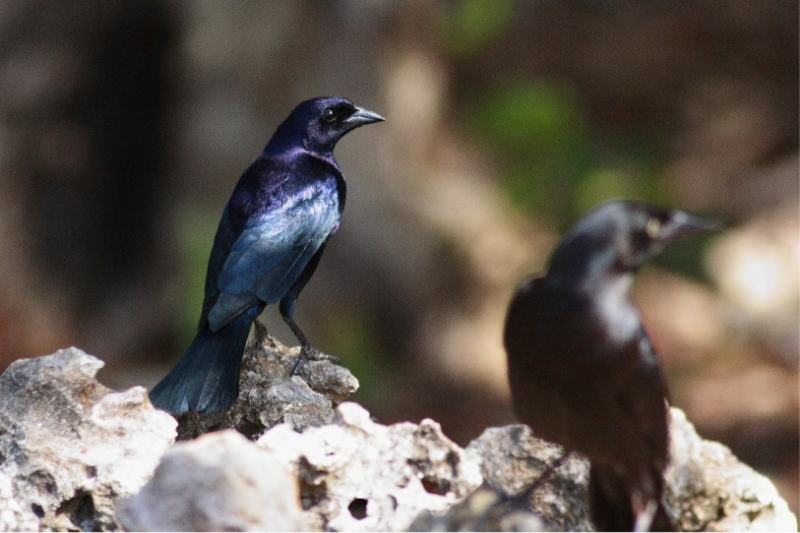 Cuban Blackbirds have learned to thrive alongside humans. These birds are known to forage through farmland and agricultural stores devastating crops and pillaging inventories (Jaramillo, Burke) (Orians) (Garrido, Kirkconnell) (Raffaele). The Cuban Blackbird image has been memorialized on national stamps. Despite their iconic status, very little is known about these birds. Recent advances in molecular genetics are redefining our understanding of these birds (Powell et al). Originally the species was classified as Ptiloxena atroviolacea and then later redefined as Dives atroviolacea (Jaramillo, Burke) (Orians) (Garrido, Kirkconnell) (Raffaele). These new technologies argue for a return to the former designation, genus Ptiloxena (Powell et al). Molecular analysis of mitochondrial DNA of all 108 species of New World blackbirds demonstrates that Cuban Blackbirds are more closely related to the genus Euphagus and Quiscalus than they are to the genus Dives (Powell et al). Because the nature of these relationships remain unclear (Powell et al), the use of the monotypic genus Ptiloxena appears most appropriate. It’s not hard to understand why the Cuban Blackbird would be placed in the genus Dives. The Cuban Blackbirds share a number of physical features and behavioral attributes with those of the other species belonging to this genus (Jaramillo, Burke) (Orians) (Garrido, Kirkconnell) (Raffaele). Like the Cuban Blackbird, members of the genus Dives are distinguished from other New World blackbirds by their curved upper bill, known as the culmen, which is also slightly hooked at the tip (Jaramillo, Burke) (Orians) (Garrido, Kirkconnell) (Raffaele). They can be seen in similar Neotropical habitats, both wooded and deforested areas (Jaramillo, Burke) (Orians) (Garrido, Kirkconnell) (Raffaele), and they share similar diets and foraging behaviors (Jaramillo, Burke) (Orians) (Garrido, Kirkconnell) (Raffaele). In addition, they easily adjust to human contact (Jaramillo, Burke) (Orians) (Garrido, Kirkconnell) (Raffaele). 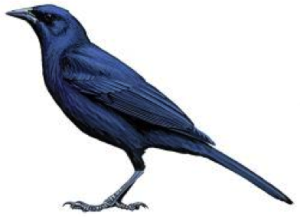 Although Cuban Blackbirds appear to physically resemble other species of the genus Dives, analysis of skeletal structure strongly disputes this (Webster). Of the 92 species of New World blackbirds studied, Cuban Blackbirds were shown to have distinctive skeletal features when compare to other blackbird species including members of the genus Dives (Webster). Skeletal differences between Cuban blackbirds and other species of the genus Dives were amongst the greatest demonstrated (Webster). Eighteen skeletal characteristics were examined (Webster). These morphologic differences appear to result from both geographic isolation (Webster) (James) and possible ensuing genetic isolation (Webster) (Powell et al) (Fraga). These birds are endemic to Cuba (Jaramillo, Burke) (Orians) (Garrido, Kirkconnell) (Raffaele). They remain residents on the island year round (Jaramillo, Burke) (Orians) (Garrido, Kirkconnell) (Raffaele). The absence of this species from the nearby islands and many of the offshore island reefs (Jaramillo, Burke) (Orians) (Garrido, Kirkconnell) (Raffaele) supports this geographic isolation contention (Fraga). Unlike other members of the genus Dives, male Cuban Blackbirds have a distinctive plumage, black highlighted by a glossy violet sheen most prominent on the upper body, for which the species derives its name (Jaramillo, Burke) (Orians) (Garrido, Kirkconnell) (Raffaele). They are often confused with another indigenous Cuban bird with a similar plumage, the Greater Antillean Grackle, Quiscalus niger. This look-alike is slightly larger, with a thinner and longer beak and has a curved as opposed to flat tail and yellow as opposed to brown eyes (Jaramillo, Burke) (Orians) (Garrido, Kirkconnell) (Raffaele). Cuban blackbirds belong to the family Icteridea, a group of New World blackbirds comprising over a hundred different species known for their songs (Jaramillo, Burke) (Orians) (Powell et al). Unrelated to their Old World counterparts, this diverse group is wide ranging (Lowther) and worldwide numbers in the hundreds of millions (Jaramillo, Burke) (Orians). However, they share a number of common features which include males with a distinctive dark plumage; hard, conical and pointed bills suited for an omnivorous diet; powerful legs and feet for foraging; long, pointed wings for strong flight and a rounded tail (Jaramillo, Burke) (Orians). Despite these shared features, New World blackbirds display a wide variety of appearances, and a wide array of social behaviors and diets (Jaramillo, Burke) (Orians). Unlike their abundant and wide ranging North American relative, the Red-winged Blackbird, less is known about its Cuban counterpart. The Red-winged blackbird, the archetypical New World blackbird, has been extensively studied and written about. Behaviors studied include mating, nesting, feeding and song. The same cannot be said of the Cuban Blackbird. Compared to the migratory Red-winged blackbird of North America, the Cuban blackbirds are slightly smaller (Jaramillo, Burke) (Orians), have a curved upper beak with a slight hooked tip and has a flat, squared tail with pointed tail feathers tips (Garrido, Kirkconnell) (Raffaele). These birds are also smaller than other species of the genus Dives (Jaramillo, Burke) (Orians) (Garrido, Kirkconnell) (Raffaele). The Cuban blackbird is typically 25-28 cm in length (Jaramillo, Burke) (Orians) (Garrido, Kirkconnell) (Raffaele). The male is slightly larger than the female weighing between 85-94 g (Jaramillo, Burke) (Orians) (Garrido, Kirkconnell) (Raffaele). The male has black plumage with a glossy violet sheen most evident on their upper parts (Jaramillo, Burke) (Orians) (Garrido, Kirkconnell) (Raffaele). Unlike the Red-winged Blackbirds (Yasukawa) but like members of the genus Dives, the sexes are similar (Jaramillo, Burke) (Orians) (Garrido, Kirkconnell) (Raffaele). Adult females are slightly duller than their adult male counterparts. Juveniles resemble adult females but are even duller brown-black. Juveniles lack a glossy sheen (Jaramillo, Burke) (Orians) (Garrido, Kirkconnell) (Raffaele). Eyes are dark brown (Jaramillo, Burke) (Orians) (Garrido, Kirkconnell) (Raffaele). The bare parts, bill and legs, are black (Jaramillo, Burke) (Orians) (Garrido, Kirkconnell) (Raffaele). Despite many similarities in behavior, Cuban blackbirds differ from other species of the genus Dives in some aspects of behavior, particularly nest-site selection and song (Balat, Gonzalez) (Prince et al) (Fraga). Geographic variation of these features is not uncommon even within a single species. By itself, this is not conclusive for species re-assignment. Like most New World blackbirds, the Cuban blackbirds are omnivorous (Jaramillo, Burke) (Orians) (Garrido, Kirkconnell) (Raffaele). They forage on the ground (Garrido, Kirkconnell) (Raffaele). They have been known to follow grazing cattle to feed off cattle parasites (Danforth) (Sazima). The majority of their diet consists of seeds from grasses, weeds and waste grain (Jaramillo, Burke) (Orians) (Garrido, Kirkconnell) (Raffaele). The remainder of their diet is essentially comprised of arthropods, mostly insects (Jaramillo, Burke) (Orians) (Garrido, Kirkconnell) (Raffaele). Less commonly; fruits, nectar, smaller vertebrates and eggs can be part of their diet (Jaramillo, Burke) (Orians) (Garrido, Kirkconnell) (Raffaele). Food and feeding behaviors resemble that of other species of the genus Dives (Jaramillo, Burke) (Orians) (Garrido, Kirkconnell) (Raffaele). Despite geographic differences, food and feeding behaviors are similar to that of the Red-winged blackbirds as well (Bird, Smith) (Jaramillo, Burke) (Orians). While providing benefit by ridding agricultural sites of unwanted weeds and pets particularly cutworms and cattle ticks (Danforth) (Sazima), these birds are known to devastate entire fields of developing grains and sugar canes (Jaramillo, Burke) (Orians) (Garrido, Kirkconnell) (Raffaele). These birds appear to be very opportunistic feeders. They are also known to feed on stored grains and sugars as well as carrion (Jaramillo, Burke) (Orians) (Garrido, Kirkconnell) (Raffaele). Even less is known about the breeding behavior Cuban blackbirds and that of other members of the genus Dives. Again, there appears to be little difference in breeding behavior known between these two groups other than nesting choice which appears to be a function of geography. These birds appear to be monogamous unlike their red-winged counterparts (Balat) (Searcy) (Garrido, Kirkconnell) (Raffaele). Breeding season lasts from April to July (Balat) (Garrido, Kirkconnell) (Raffaele) (Fraga). Nests are built by both sexes (Balat) (Garrido, Kirkconnell) (Raffaele). Fledglings are seen between May and August (Balat) (Garrido, Kirkconnell) (Raffaele). Typically, there are 3-4 eggs in each clutch (Balat) (Garrido, Kirkconnell) (Raffaele). Cuban blackbird eggs are pale gray-white with dark brown markings predominantly at its larger end (Balat) (Garrido, Kirkconnell) (Raffaele). The eggs of other species belonging to the genus Dives appear pale blue with similar markings at its larger end (Balat) (Garrido, Kirkconnell) (Raffaele). Females incubate eggs. Incubation period is about 12 days (Balat) (Garrido, Kirkconnell) (Raffaele). The incubation period of other members of the genus Dives remains unknown (Balat) (Garrido, Kirkconnell) (Raffaele). Chicks are fed by both parents (Balat) (Garrido, Kirkconnell) (Raffaele). The nestling period of all species belonging to the genus Dives as well as Cuban Blackbirds also remains unknown (Balat) (Garrido, Kirkconnell) (Raffaele). 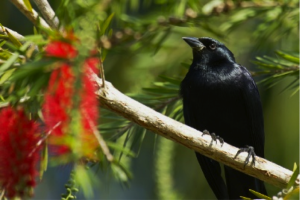 Unlike the Red-winged blackbird, the Cuban blackbird and the other species of the genus Dives flock and roost in relatively small numbers (Jaramillo, Burke) (Orians). They are typically found in pairs (Garrido, Kirkconnell) (Raffaele). They may flock and roost with other blackbirds such as the tawny-shouldered blackbird (Agelaius humeralis), the Cuban counterpart to the Red-winged Blackbird, and the Greater Antillean Grackle (Jaramillo, Burke) (Orians) (Garrido, Kirkconnell) (Raffaele). Despite flocks and roosts of small numbers when compared to that of the Red-winged Blackbird, hundreds compared to millions, the Cuban blackbirds have been known to do their share of crop damage (Jaramillo, Burke) (Orians) (Garrido, Kirkconnell) (Raffaele). During times of slavery, slaves often allowed these birds access to stored grains and sugar (Verona). Slaves would also help themselves to a share of these stores. The slaves would then blame the blackbird (Verona). When questioned about the missing stores, they would reply, “La culpa de todo la tiene el Toti” (Verona). Translated from Spanish this means, “All the blame belongs to el Toti” (Verona). This saying remains common place in Cuba to this day. Cuban blackbirds have a range of voice and song. Unlike the Red-winged blackbird, both sexes participate equally (Kroodsma). Sexual dimorphism in song appears less pronounced amongst tropical populations (Price et al). In addition, unlike other species of the genus Dives, males and females do not appear to participate in duets (Jaramillo, Burke) (Orians) (Garrido, Kirkconnell) (Raffaele). Voice consists of a mixture of musical and nasal calls such as “tew-tew-tew” and “twee-o” and “twee-te-to” (Jaramillo, Burke) (Orians) (Garrido, Kirkconnell) (Raffaele). The IUCN Red List of Threatened Species classifies the Cuban blackbird as a species of “least concern” with regards to extinction (BirdLife International). There appears to be no known threats to this species (Stotz). Exact numbers are unknown (Davis). Recent estimates place the Cuban blackbird amongst the top two or three most abundant bird species on the island (Pozas, Balat). As new technologies redefine our understanding of the Cuban Blackbird, much still remains to be learned. Geographic isolation of Cuba and inability of the species to disperse appears to have played a key role in the blackbird’s development. However, detailed evolutionary relationships remain elusive. Nevertheless, the political isolation of Cuba may have played an equally important role in why such little is known about these abundant birds. Balat, F., Gonzalez H. (1982) Concrete data on the breeding of Cuban birds. Acta. Sci. Nat. Brno., Vol. 16(8): 1-46. Bird, R.D., Smith, L.B., (1964) The food habits of the Red-winged Blackbird, Agelaius phoeniceus, in Manitoba. Can. Field-Nature, Vol. 78: 179-186. Danforth, S.T., (1935) Investigations concerning Cuban birds, with special reference to their economic status, and consideration of those which might be desirable for introduction into Puerto Rico. The Journal of Agriculture of the University of Puerto Rico, Vol. 29(4): 421-437. Davis, D.E. (1942) A new census method applied to Cuban birds. Ecology, Vol. 23(3): 370-376. Fraga, R. (2011) Cuban Blackbird (Ptiloxena atroviolacea). Handbook of the Birds of the World Alive. Lynx Edicions, Barcelona. Garrido, O.H., Kirkconnell, A. (2000) Field Guide to the Birds of Cuba. Comstock & Christopher Helm, Ithaca & London. James, F.C. (1983) Environmental component of morphological difference in birds. Science (Washington D.C.), Vol. 221: 184-186. Jaramillo, A., Burke, P. (1999) New World Blackbirds: The Icterids. Christopher Helm & A&C Black Publishers, London. Kroodsma, D.E., James, F.C., (1994) Song variation within and among populations of Red-winged Blackbirds. Wilson Bulletin, Vol. 108: 156-162. Lowther, P.E. (1975) Geographic and ecological variation in the family Icteridae. The Wilson Bulletin, Vol. 87(4): 481-494. Orians, G.H. (1985) Blackbirds of the Americas. University of Washington Press. Seattle, Washington. Price, J.J., et al. (2009) Losses of female song with changes from tropical to temperate breeding in the New World blackbirds. Proceedings of the Royal Society B: Biology, Vol. 276(1664): 1971-1980. Powell, A.F.L.A., et al. (2013) A comprehensive species-level molecular phylogeny of the New World blackbirds (Icteridae). Mol. Phylogenet. Evol. In Press. Pozas, G., Balat, F. (1981) Quantitative and qualitative composition of the bird community in a garden suburb of Habana (Cuba). Folia Zoologica, Vol. 30(2): 155-164. Raffaele, H., et al. (1998) A Guide to the Birds of the West Indies. Princeton University Press, Princeton, New Jersey. Sazima, I., Sazima, C., (2010) Cleaner birds: an overview for the Neotropics. Biota Neotrop., Vol. 10(4): 195-203. Searcy, W.A., Yasukawa, K. (1995) Polygyny and Sexual Selection in Red-winged Blackbirds. Princeton University Press. Princeton, New Jersey. Stotz, D.F., et al. (1996) Neotropical Birds: Ecology and Conservation. University of Chicago Press, Chicago. Webster, J.D. (2003) Skeletal characteristics and the genera of blackbirds (Icteridae). Condor, Vol. 105: 239-257. Yasukawa, K., Searcy, W. (1995) Red-winged Blackbird (Agelaius phoeniceus). A Poole, F Gill, Eds. The Birds of North America, Vol. 184. The Academy of Natural Sciences, Philadelphia, and The American Ornithologist’s Union, Washington D.C.